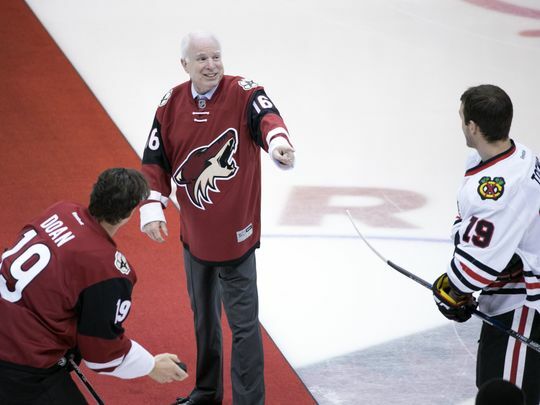 The distinguished Senator from Arizona who passed away last Saturday was an Arizona Coyotes' season ticket holder and big sports fan. 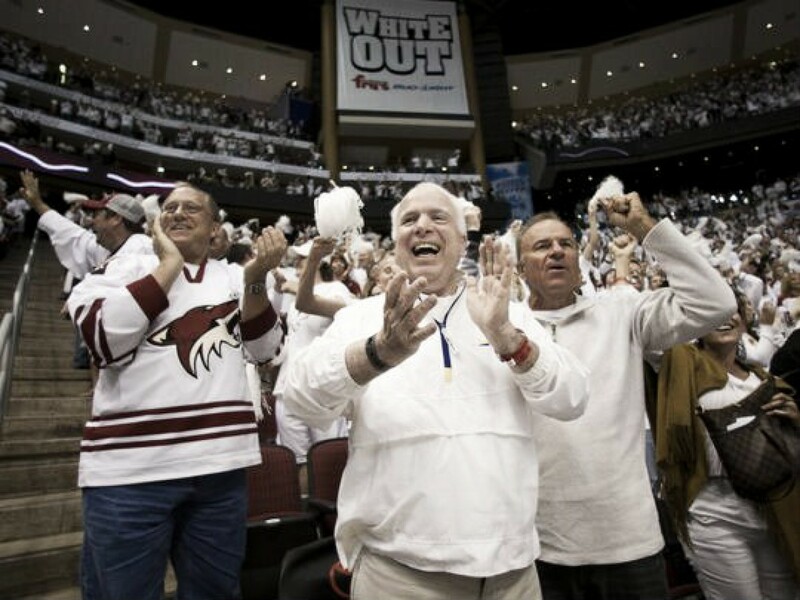 Sen. John McCain was a big fan of Arizona sports in general and was a season ticket holder for the Arizona Coyotes' games. One of his favorite Coyotes' players was former captain Shane Doan. He also enjoyed attending and cheering on the Arizona Cardinals, Arizona Diamondbacks, and Phoenix Suns. Thousands are going to be attending a memorial ceremony at 10 a.m. on Thursday at North Phoenix Baptist Church. The Cardinals' star receiver Larry Fitzgerald will speak at the gathering and Diamondbacks' former star outfielder Luis Gonzalez along with Doan will serve as pallbearers. Former Vice President Joe Biden will provide a tribute to the great Senator from the Grand Canyon state. The Cardinals are scheduled to play the Denver Broncos at the University of Phoenix Stadium in Glendale, AZ later that night. Fitzgerald had this to say about McCain, "His generosity, just his beliefs and ideas, things he stood for. I'm at a loss for words for what he's done for this great state of Arizona, and our nation and internationally. Just his heart, his compassion, his sacrifices as a POW and just the legion of people he's helped along the way. He'll be remembered forever." Gonzales' statement reflexes some of the same sentiment. "Senator McCain was not only a great man and patriot, but a great D-backs' fan and I am proud to consider him a dear friend. We always knew we could count on him to root us on - from the ballpark, from his home and from all the way across the country. On behalf of my entire family, our thoughts and prayers are with Cindy and his family and we are very grateful for all that he did on behalf of his country." "Senator McCain was a shining example of what a modern leader should be. He represented Arizona and the United States with class and dignity, and the courage and incredible strength that he demonstrated, in every test a man could face, impacted everyone who simply heard his story. His love for life was contagious and his passion for his family, state, country and Arizona sports teams left you optimistic and energized. I am so honored to have been able to call Senator McCain my friend and am grateful to his family for allowing my family to be part of their lives. Our hearts go out to Cindy and all the family during this difficult time." John was someone who loved the local sports teams and made it known by showing up at a Cardinals' practice in August to cheer on the players. He also called Coyotes' captain Shane Doan after a game to give him a pep talk or his insight on the game he just attended or watched religiously. McCain himself was a self-described average high school athlete but seemed to still look at pro athletes with the gleam in eyes as if he were still a child. He also loved talking sports with just about anyone who would listen to him... a true dedicated sports' fan. Doan became close friends with McCain and often discussed many issues besides hockey. 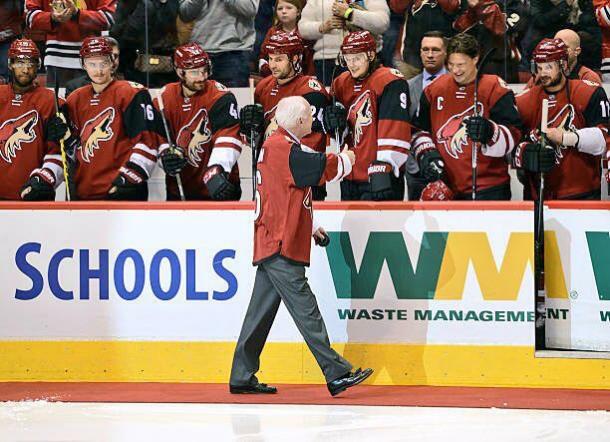 It's kind of impossible to be around somebody like him and not learn," Doan said. One essential lesson Doan learned was: Do what you think is right, especially when it's not easy. "That sounds so simple but at the same time it's so important," Doan said. "That's where him being called the maverick comes from. Often people do what's right because it's the norm. But if you do right when it's not the norm, it's being a maverick." For the Arizona Coyotes as well as all the sports teams in Arizona, they lost a true patriot, a hero as defined by his many years serving our country and someone who was a loyal and supportive fan. One thing is certain, John McCain will be remembered as someone who loved sports and was loved back in return. His legacy will live longer than any sports franchise... and we all know he'll continue to cheer his Arizona sports teams even in his physical absence. To John McCain ALL Arizona sports teams are winners! Do you have any memories of John McCain at sporting events? Let us know in the comment section below and be sure to give us a follow on Twitter by searching (VAVELNHL_ENG).